Graduated from journalism at Faculty of Political Sciences in Zagreb. In 2005/2006 she was a stipendee of Soros Supplementary Grants program. She works as a journalist for web site www.kupus.net. 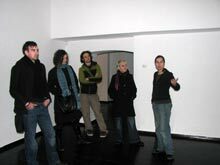 In 2007 she was a coorganizer of the project Slobodne veze – Contemporary artistic practices on international scene today. 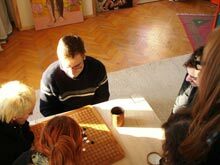 She is currently completing her postgraduate studies in cultural management and politics in the Balkans at UNESCO chair in Belgrade. Graduated from sinology and sociology of culture at Faculty of Arts in Ljubljana. In years 2004-2006 she studied at University of Science and Technology in Kumming, China, where she assisted with art projects and research at Lijiang Studio. Between 2006-2007 she was project manager at Gallery fo Contemporary Arts in Shanghai, China. She works as a reporter for leading slovenian newspaper Dnevnik. Graduated from communication science at Faculty of Social Sciences in Ljubljana. From 2001 she is enrolled in postgraduate program of media studies at ISH Institute in Ljubljana. In 2006 she was on postgraduate study visit at City University of London. 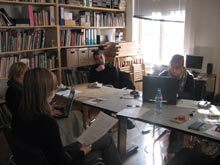 Since 2006 she is external collaborator of E-archive and Studio 6 programs of SCCA-Ljubljana. Before she was participating at various projects (writer for Muska magazine, assistant at projects of Slovenian Film Fund, assistant of CMA Euroschool at Jožef Štefan institute etc.). 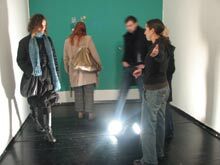 In 2004 she was an exhibitions curator and PR responsible at Slovenian Etnographic Museum. 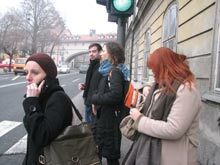 Student of cultural studies at Faculty of Social Sciences in Ljubljana. He assisted with various projects within Aksioma institute. Produced, directed and played in several theatre plays. 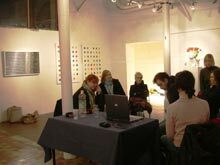 In 2007 he organized an exhibition of posters of DJ collective Sindikat. He works as an assistent at ŠKUC Association. Graduated in history of art and italian language at Faculty of Arts in Zagreb. In 2003 she completed an internship at Guggenheim museum in Venice. In 2006 she coorganized documentary intermedia project Vitič_pleše within Croatian Film Fund. She collaborated with many exhibitions (Black&White, Zagreb, POS – Pozitiv Negativ, Zagreb, SC Danas/Iz jučer/za sutra in Gallery SC, Zagreb) and theatre plays (Ex-pozicija). She works at Filip Trade as a curator of their collection of contemporary croatian art.